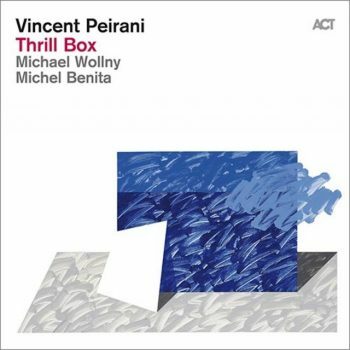 Thrill Box is Vincent Peirani’s debut release on the ACT Music label. Its title refers to Peirani’s instrument of choice, the accordion. For many, the accordion springs most readily to mind as an East European folk instrument, for others it evokes images of Morris dancers on warm English spring evenings (although that’s more usually the concertina) or summers at a French pavement cafe, for others still it’s part of the musical culture of South America. On this mixture of original tunes, jazz classics and American traditional songs it’s all of those things—as well as a front-line jazz instrument. Peirani started out as a classical music scholar, aged 12 and he’s played with stars including fellow ACT Music artists Ulf Wakenius and Youn Sun Nah. His technical mastery of the accordion is impressive enough, but he couples this with a strong sense of humor and of musicality. He opens and closes Thrill Box with stunning solo performances of “Choral” and Joseph Canteloube’s “Bailero.” Both tunes demand control and precision from the performer: Peirani shows that he has both skills in abundance as well as the maturity required to maximise the tunes’ emotional impact. Benita is in masterful form throughout, never playing two notes if one will suffice—and always playing the right one. Wollny complements Peirani’s accordion melodies with some delightful melodic phrasing of his own—his playing on “Waltz For JB” is superb—and also adds depth with his rhythmic chordal playing.